Think that aircraft seat pitch can’t get any tighter than 28 inches? Think again. Ultra slimline economy class seat concepts under development by Zodiac Aerospace and other interiors companies could accommodate a 27-inch seat pitch, and are targeted at the short-haul market. The latest innovations in seat geometry are particularly well timed. EASA last week issued a Type Certificate (TC) update that provides a path forward to increase capacity on the Airbus A320 to 195 seats – a whopping 15 more seats than the current 180-seaters now flying, and six more than the 189-seat capacity for which Airbus recently sought approval. 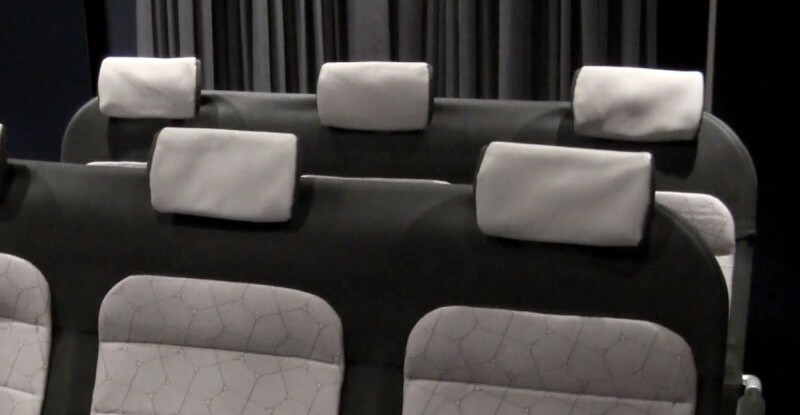 “Modification 156723 enables the maximum seating capacity to be increased up to 195. This modification defines a virtual envelope of the Layout of Passenger Accommodations (LOPA) and does not constitute an authorization for the installation of seats in excess of 180. A separate approval is needed for the installation of the individual customized cabin layout and the necessary cabin adaptations up to 195 seats,” said Airbus. The European airframer can incorporate its high-capacity aft galley configuration with modular lavatories to add some seats to the A320. 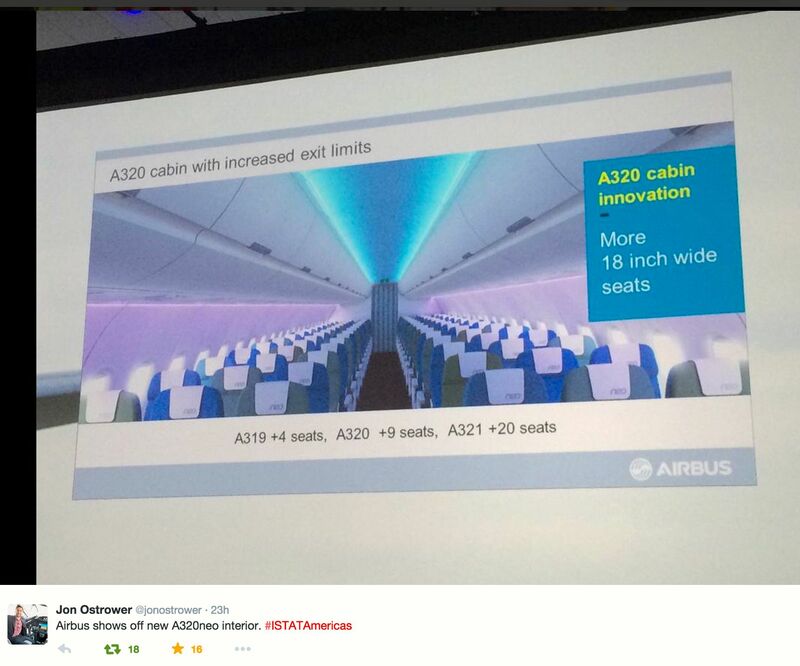 But savvy flyers wonder whether super slim seats will be pitched at 27 inches to accommodate 195 seats. They’re also asking how evacuations can be achieved in 90 seconds, even with larger doors and wider evacuation slides. We know that Airbus believes seat width plays a far more important role in passenger comfort than seat pitch. 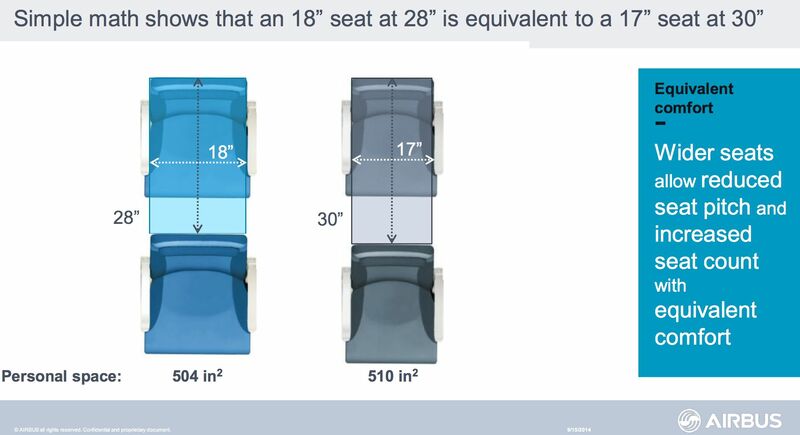 Indeed, the airframer suggests that an 18-inch wide seat (featured on the A320) pitched at 28 inches is equivalent to a 17-inch wide seat (featured on the Boeing 737) pitched at 30 inches. It’s not a stretch to assume, then, that the airframer and its airline customers see an opportunity to shave another inch from the pitch, offering 27 inches, and still remain competitive. Seat makers have been prepping for the prospect that higher-density aircraft configurations are in the offing. Zodiac, for instance, last year unveiled three new forward facing seat concepts at the Aircraft Interiors Expo in Hamburg. Two of the three designs were pitched at 27 inches, even though a 28-inch pitch has traditionally been considered an informal bare minimum standard in the industry. Zodiac executive VP communications and investor relations Pierre-Antony said he believed the seats would pass certification at 27-inch pitch because the requirement is not about inches, but rather “the ability to debark the aircraft very quickly”. A third design, a carbon-fiber composite seat known as L3, was displayed in a 28-inch pitch, and is now being offered to airlines. Developed in partnership with Hexcel, L3 is “quite advanced with our certification process”, said Vastra. See a video of the three designs below. Yet, it seems the only thing that held airlines back from adopting 27-inch pitch on the A320 in the past is the fact that the aircraft was only certified for a maximum load of 180 seats. 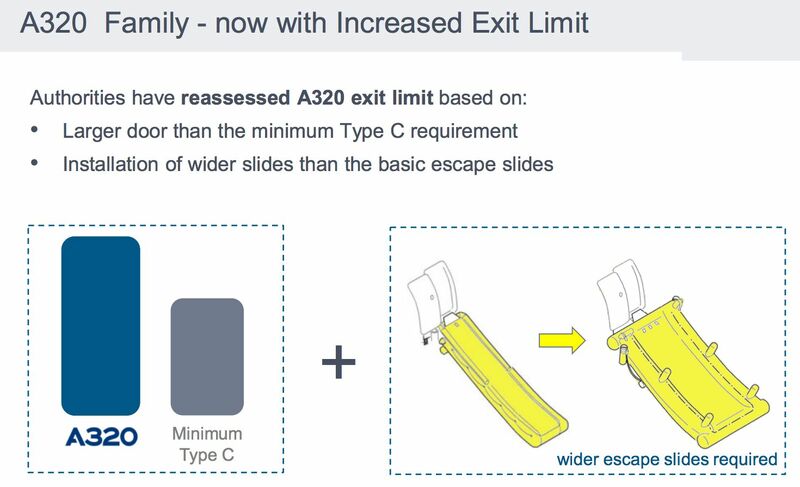 “The A320 has an exit limit of 180, and you don’t even have to go to 27 inches” to achieve that, Lufthansa Group executive VP fleet management Nico Buchholz told journalists at a media briefing in New York in late 2013. In addition to certifying the A320 for more seats, Airbus has developed a overhead bin solution for the narrowbody, as first reported by RGN. Like the Boeing 737NG’s Sky Interior, the new pivot bin coupled with mood lighting – shown today at the ISTAT conference in Phoenix for the re-engined A320 – gives passengers a sense of more space. But at the end of the day, we know we’re a hair’s breath away from being stacked like cordwood in-flight. See Zodiac’s new seat concepts in the video below. Note that I am just shy of 6ft tall. Wow, that’s not bad knee clearance for 27″ pitch. I think I’d squish into that about the same as I do on a standard 30″ seat (eg: a bit crushed and a spot of pain – I’m over 6′ tall & about 250 pounds 🙂 ). How was the comfort & support for your back & bottom though? 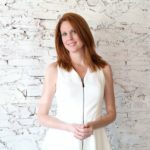 What would it be like after an hour sitting in one position with very little room to change positions? While lack of recline isn’t such a big issue (the person in front of you is already pretty close so it’s actually a bonus 🙂 ) the padding looked pretty slim. The 95th percentile of North American males has a buttock-knee depth length of appr. 25.2inch. That leaves 1.8inch for the seat. Fun fact: while women are on statistical average 4-5inch shorter than males, they only have about 1 inch less in buttock-knee depth. Cabin Crew are expected to evacuate all passengers in 90 seconds?? People will never get out of the row in time. 90 seconds for evacuation is for the cabin crew while they are in training and gym junkies. Watch what happens in the real world when fat, old people try to get out carrying their bags of medicine!!!!!!!!! The current race to squeeze more and more seats into a finite space is plain stupidity. It will take a forced landing followed by a major fire that kills most of the passengers to change the situation. Until comfort and safety return, I will only fly when absolutely necessary. Paying money to be subjected to this type of pain and the risk of DVT from lack of fresh air really is starting to make me think again about going on holiday by air. The width of the new seats is the defining measurement for comfort when flying for more than an hour if you have any sort of medical condition that requires you to change your position on a regular basis for blood flow or muscle stress. As we age, this gets to be something you have to do, not something you want to do, and the discomfort is certainly not something you pay for! I can’t imagine how bad it would be to fly with so many people around coughing and farting and smelling of stale BO with breath that could take the chrome off a tow ball but apparently even though economy class probably gives the airlines a quantifiable profit, they treat people in that part of the aircraft as scum. Off topic but relevant – back when you paid real money for a seat and had space, I suppose we were all flying what is now called premium economy? Going upstairs meant you were first class and business class was at the pointy end. Hot towels and a boiled sweet anyone? Hi Mary ! Very timely and to-the-point, as always ! … what about setting up that lndustry & Media “Egress Test POLL” for the exit limit revision of the A321 ? Sure, take away pitch and increase width and you get the same or more personal space. But when you take away pitch, it’s not like a person 6’2″ (such as me) can snap his fingers and shift four inches of height into width. And I wonder why I quit flying except when ABSOLTELY necessary over five years ago. Citroen for the 2CV Series and Fiat for the Panda line used to have hammock like seating that was rather comfy to sit on even for longer travel times. Is there some scientific research writeup around that covers the tradeoffs between seat width, seat pitch and cushion height?